Mirra also cares about what you, the consumer wants. They did a survey of 500 Women to find out what they most wanted in beauty products. Some of the findings? *Mirra Replenishing Body Wash- This one is my favorite out of the whole package! I love everything about this body wash. It has a really beautiful shimmering gold color. The scent is Bamboo and Honey. It certainly smells good enough to eat. This body wash contains Glyceryl Oleate and Brazil Nut & Aloe extracts. It makes my skin feel really clean and soft. It also leaves me smelling wonderful. *Mirra Exfoliating and Detoxifying Cleanser- This cleanser is white and looks creamy like a lotion. It has oxygenated derma-beads and apricot seeds (a.k.a. exfoliating beads- which is a requirement for me). It is supposed to be Apricot scented, but it smells like something else to me (I can't put my finger on what it does smell like, but it smells good). I like the cleanser and have been using it a lot, but I wish it felt a little less like lotion. It does however, feel great after you wash it off. It also leaves my skin a little tingly which I love. *Mirra Smoothing Shampoo- This shampoo is designed for frizziness (which is my worst problem). It is a clear gel that smells really good. It contains aloe extract, wheat and soy protein. It is also paraben-free, formaldehyde donor-free and contains all natural ingredients. I have been using this as my main shampoo for the last two weeks and I am very happy with it. My frizziness does seem to be less. The only thing I don't like is that it makes my hair feel almost too clean. I can literally run my finger down my hair and it squeaks after using this. This problem seems to be solved by using it with the conditioner (see below). So, definitely buy & use these two together! Did I mention I love the smell? *Mirra Smoothing Conditioner- I love the conditioner. It makes my hair feel soft and moisturized and like all the Mirra products, it has a great smell. The conditioner contains all of the same features of the shampoo, so I am not going to list them again. This conditioner is white, creamy and exactly what you would expect of your favorite conditioner. *Mirra Protective Lotion- This lotion is white, creamy and has a wonderful Lemongrass & Ginger scent. It also contains Oleosomes and Copaiba & Olive oils in addition to ginger extract. Unfortunately, I am very picky about my lotion. I thought this lotion smelled wonderful, but I did not like the way it felt on my skin. It feels thin and sticky when it is first put on. However, if I feel the area that I applied it 20 minutes later, it feels soft and smooth. It also still smells good. If you don't mind a little stickiness at first, this would be great for you. *Mirra Wrinkle Reduction Eye Cream- This eye cream is white and creamy with a light, sweet scent. It contains sunflower oil, soybean protein and pro-vitamin A. It is non-greasy and safe for contact users. At the age of 26, I don't have any use for a wrinkle cream. I did try it a few times for review and I am mailing it to my Mom to let me know what she thinks of it. I personally did not mind the feel of it. I like that it is non-greasy. It also has a faint sweet scent that I really like. *Mirra Hydrating Night Treatment- This cream has the same color, feel and scent as the eye cream. The hydrating night treatment is meant for fine lines and wrinkles and is applied at night after cleansing face and neck. This is the same case as the eye cream when it comes to my review. I tried it, but since I do not have wrinkles and fine lines (Thank goodness!) I can not attest to how it works on them. I thought that it felt good on my face and did not feel greasy. I recommend all of these products. While the lotion is not the best in my opinion, it is probably just me being picky. For me, the scent of the product is very important when it comes to shampoo, conditioner, lotion, cleanser, etc. and these products smell great! They also work well. I only wish I lived near a Kroger. I think I will have to have my Dad to mail me some of their body wash when I run out (he lives in Cincinnati, OH). Go here to download a coupon for $5 off any 2 Mirra products and for more information. Thanks to both Kroger and Global Influence for allowing me to review and giveaway these products! Tell me which of the products you are most excited about trying. It can be a product I talked about or any of the Mirra products from here. 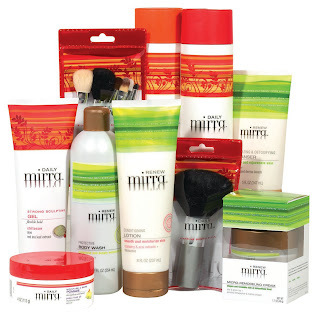 @Latsyrc728 has a Mirra Beauty Products Review and #Giveaway http://goo.gl/fb/hcWd (ends 03/29) #contest Please RT!! Giveaway ends 3/29/10 at 9pm EST. Giveaway is for US residents only. Winner will be chosen randomly. Winner will be contacted via e-mail and then will have 48 hours to respond before a new winner will be chosen. Disclaimer: I received the mentioned products in exchange for this review. I was compensated in no other way. The thoughts here are my own honest opinions. I hope I get to try the night treatment. I need as much help as possible!!! Great giveaway!! I would like to try the Mirra Hydrating Night Treatment. I never had a wrinkle 'til I had kids! I want to try the smoothing shampoo and conditioner. Most interested in trying the conditioner. Mirra Exfoliating and Detoxifying Cleanser. I am a fan on FB - Lydia A.
I entered the Supermarket Smarty Giveaway. I'd love to try to exfoliating and detoxifying cleanser!